Charles Thomas Crowden, an early automotive designer and engineer, settled in Leamington with his family, in Eastnor Grove in the 1890s. 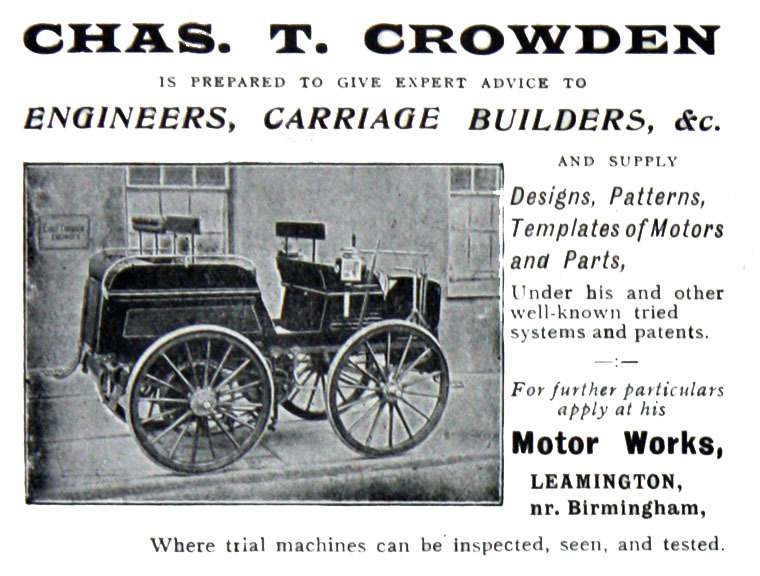 Charles Crowden came to Leamington and the motor trade via an early interest in engineering and tool-setting in Bath, fire-engine design in London, safety-bicycle development, and finally, the Great Horseless Carriage Company, at the Motor Mills in Coventry.In 1884 Crowden designed a pioneer bicycle, – still being exhibited in Birmingham 19 years later, alongside the latest model. He acquired his first motorised transport patent in 1896, when employed as chief engineer at Humber and Company cycle manufacturers in Beeston. Charles Crowden was in at the very start of the British motor industry, when the earliest Daimler, Humber and Pennington vehicles were being designed, built and tested. He was clearly a leading light in the industry. In January 1897, The Autocar reported that “…great progress is made in the factory of the GHCC. It is only two months since Mr Charles Crowden got to work at Coventry, and we have seen the first half-dozen of the carriages that are being put through. Nonetheless, by 1898, keen to develop designs of his own, Crowden left the GHCC, having acquired the old Mulliner carriage works in Packington Place, Leamington. In his new Leamington works, Crowden experimented first with steam and paraffin-powered models before moving on to petrol. In 1900, he produced a 5-horsepower dog-cart. 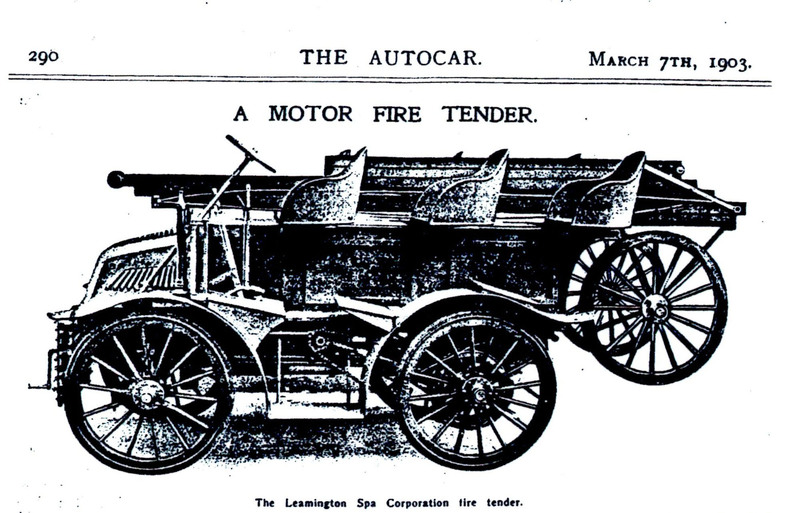 In 1903, he supplied Leamington Corporation with their first motorised fire engines. He later built fire tenders for Worcester, Leicester and Norwich Union. 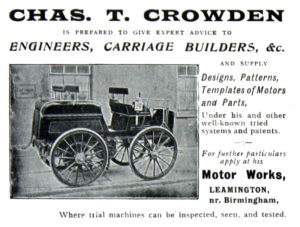 Mr Crowden also made local media headlines for a number of reasons other than his talents as a designer and motor manufacturer: – a case at the County Court in 1900, relating to a patent for improvements to motor traction, and a second when an employee driving a Crowden car was in collision with a horse and trap en route from Southam. Although Charles Crowden retained a business base in Warwickshire and continued to develop motors, he moved in 1905 to Kent, as consulting engineer on a number of products, including the development of automatic sprinklers, and, during WW1, machine guns. He died in Nottingham in 1922.